Although some of us haven't started our holiday shopping, and a few are finished, we are already plotting our first holiday shopping break by popping into a highly anticipated restaurant that opened Monday in the South End. Although some of us haven't started our holiday shopping, and a few are finished, we are already plotting our first holiday shopping break by popping into a highly anticipated restaurant that opened Monday in the South End. 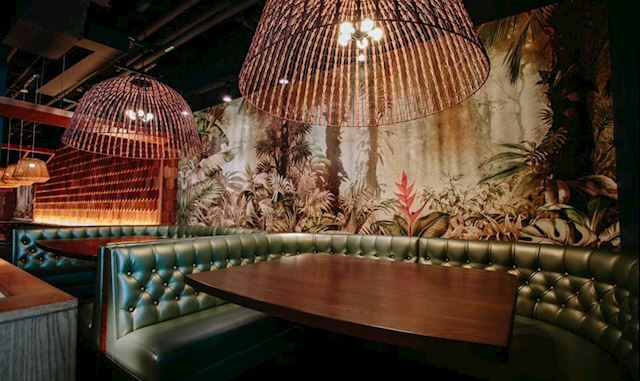 Shore Leave, a tropical-inspired restaurant from the Bar Mezzana team, is opening across Harrison Avenue from the neighborhood's popular Ink Block development. Bar Mezzana (361 Harrison Ave., Boston) has quickly become a neighborhood go-to in its two years of business, featuring southern Italian fare and a popular bar area. Its new sister across the street, around the corner, and down some stairs at 11 William E. Mullins Way features tiki cocktails and meals from the Pacific Rim. Boston magazine got a sneak peek, and they describe cocktails in coconut mugs and meals ranging from a whole-roasted Rohan duck to fried clam bao. The funky glassware is even available for purchase to take home for your own tiki party- enough to almost forget Jack Frost waiting to nip your nose outside this upcoming winter.